Children learn rapidly to negotiate both image and word, our two primary modes of signification, which perform their pas de deux with ever-increasing complexity in today’s culture. With respect to children’s books, we need only gaze wide-eyed at the meteoric rise of the graphic novel. Some of them reward readers with clever artistry and formal innovation. Most of them appeal to our twin penchants for novelty and entertainment. But could a graphic novel enrich children’s cultural lives with a range of content drawn from legends, yarns, and folklore of the past? It would be a work that—hand-in-hand with its trendy sequenced picture format—fulfills one of the perennial aims of children’s literature: namely, that of passing on the wisdom of previous ages. In this set of three graphic novels, Steve Sheinkin has made a stunning contribution to children’s literature. And it must be emphasized at the outset that his work is accessible to all children, by no means only to Jewish ones. Just when we crave role models for youth who display a reliance on brains rather than brawn, and who exemplify compassion, compromise, and cooperation rather than the escalation of conflict, along comes Rabbi Harvey. Sheinkin combs many sources for his characters and plots, including compendia of Jewish wisdom from the Talmud, Kabbalistic and Hassidic writings, anthologies of Yiddishkeit, witticisms, and prophetic maxims. He weaves these sources seamlessly into short stories, often with several episodes and layers so that they bear many re-readings, and children laugh and understand them better each time. At the end of each volume Sheinkin appends a list of suggestions for further reading so that the books serve not only as delicious and satisfying repasts but also as Vorspeisen—invitations to further learning. This very notion of a children’s book as a brief stop along paths of lifelong learning fits perfectly with the ethos that is lovingly expressed in these books: they exude the Jewish reverence for knowledge. When we meet Rabbi Harvey, he is wielding a simple broom and sweeping up the floor of his barebones bachelor pad while singing a cowboy ballad. A knock on the door admits a hopeful petitioner. Nathan the candle maker has come to seek his counsel. “Okay,” the rabbi readily agrees, thus consenting to help the fellow solve his unstated problem. But then in the same bubble, Sheinkin adds words that deprecate the rabbi’s own knowledge: “but I know very little about candles.” The joke—explicated to me with giggles by a seven-year-old—is that any candle maker would already know about candles and would therefore be unlikely to consult a rabbi about his own business. But the rabbi’s combination of modesty and wit proves to be a hallmark of the series. Utterly unassuming, his heroism consists not merely of a readiness to help, but also of turning under pressure and danger to the wisdom of his fathers. Above all, he is distinguished by an uncanny gift for empathy, a talent for putting himself in someone else’s shoes. He proceeds with mercy and with justice. In one story, ideal for children, Rabbi Harvey goes to Denver to order a new suit of clothes from his tailor. Dropping the finished garment off in his hotel, he feels hungry, notices a party in the lobby and introduces himself. But the waiters, the governor, and the guests all give him the brush off. Rabbi Harvey returns to his room and changes into his new suit. He comes back to the party, and now everyone greets him with civility and deference. He is invited to sit at the governor’s table. Instead, he undresses. Draping his new jacket and trousers over his chair, he addresses them directly and tells them to eat and drink. “When it was just me,” Rabbi Harvey says, standing there in his underwear and talking to the pieces of his new suit, “I was not welcome. So you must be the one they wish to join them.” For children growing up in an environment drenched in advertising and brand names, the lesson will strike home. And children do, of course, delightedly personify inanimate objects. A recurring feature of the series is “Stump the Rabbi,” an annual occasion during the town fair when Rabbi Harvey sits behind a little table outdoors and submits to questions. This graphic format showcases one jewel of sparkling wisdom after another, and the nuggets fly by quickly so that children benefit from re-reading them. A woman asks Rabbi Harvey about a new rabbi in town who says he can perform miracles. Is he, she wonders, a fake? Rabbi Harvey asks her whether this person claims he can stop her from thinking bad thoughts. When she says yes, Rabbi Harvey proclaims him instantly fraudulent. What matters brilliantly here is just how the ancient judgment accords with what we know about child development, for children come only gradually to understand that each person’s mental life is private and that wishes are separable from acts. Exactly along the same lines, a child I know relishes especially Rabbi Harvey’s answer to a petitioner who relates a dream in which he finds himself in a sinking ship with his brother and sister and can save only one person besides himself. What, he asks in consternation, should he do? “Wake up,” replies Rabbi Harvey laconically, without skipping a beat. Word play, a staple of rabbinic argument and of Jewish humor, occurs throughout the series. Children learn to catch the ambiguity of language and to discover its amazing powers. Nathan the candle maker goes off to serve as a teacher in far away Utah and needs to send his term pay home to Colorado. A traveling salesman refuses to help, but Nathan writes him a note stating that if the fellow takes the small bag of silver dollars all the way to Nathan’s wife in Elk Ridge, he can give her as much as he wants. Greedily, the merchant now agrees, and when he reaches Elk Spring, he gives Ruth, the wife, just one coin and keeps the rest for himself. Terribly upset, Ruth consults Rabbi Harvey, who asks the salesman to see Nathan’s note. After staring at it and thinking it over (Rabbi Harvey always takes time to think), he declares to Ruth that her husband is a very clever man. Turning to the salesman, Rabbi Harvey now asks this curmudgeon how much of the money he wants. When he replies: “Ninety-nine dollars,” Rabbi Harvey directs him to hand over exactly that sum to Nathan’s wife. More than any other aspect of the series, its moving and sometimes hilarious portrayals of empathy constitute Sheinkin’s greatest gift. A little boy named Asher thinks that he is a chicken, lives under the kitchen table, and refuses to go to school. Unable to cope, his parents finally turn him out of the house. When Rabbi Harvey sees the naked child eating kernels of corn from the ground, he offers to help. He asks the parents to bring the boy back indoors, and then he himself strips naked and climbs down under the table with Asher. They cluck at one another for a while and little by little begin to talk. Eventually, one garment after another is donned by both of them as Rabbi Harvey reveals to the boy that freedom of choice can extend beyond rebellion to encompass an ever-wider range of options and behaviors. In another story, a poor couple, Otto and Edna, suffer from cold and hunger in their small cabin. They decide to write a letter to God, and after much ado they toss their verbose appeal into the frosty wind. By chance it lands on Rabbi’s Harvey’s hat. After reading it, he decides to ask a wealthy but stingy woman, a certain Mrs. Zellerbach, for charity. Knocking on her door, he refuses to enter her home but stands outside on the stoop, recounting the woes of the destitute couple. Blue and shivering after a few minutes, Mrs. Zellerbach begs the rabbi to stop talking because she is cold. Can you, he asks her, imagine what it must be like for Otto and Edna to live this way day and night? She gives him the donation he seeks. 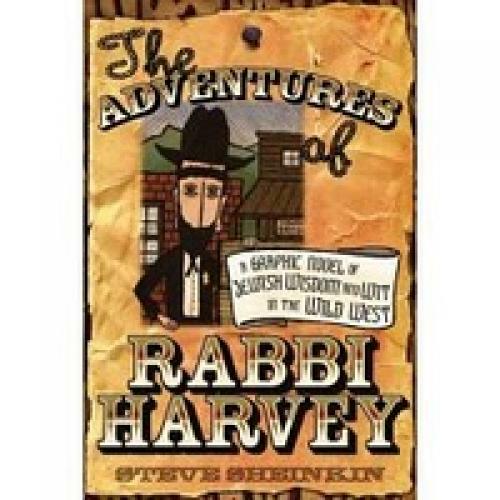 When one of my colleagues learned about the Rabbi Harvey books from me, he noted with condescension that, after all, these are just old Jewish jokes. Aha! I countered, that is precisely the point: Old to you! But to a whole generation of children, they are new and wondrous. In Mangalore two years ago, at the Children’s Literature Association of India annual meeting, I heard an editor from Delhi puzzling over how to judge submissions that attempt to re-package—in comic book or graphic novel format—tales from the Ramayana and Mahabarata. Could such re-stagings, she wondered, possibly preserve the genius and beauty of their remarkable originals? Enthusiastically, I introduced her to Rabbi Harvey.